Night Vision 2.5x42mm binoculars with illuminator will light up the night for you . The 2.5x42 mm binoculars offer a compact, Gen-1 design that's lightweight and exceptionally comfortable to use over long periods. 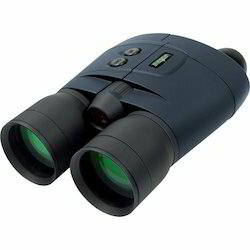 We are listed amongst the famous organization in the domain, engaged in offering Night Vision Binocular. Comes with illuminator will light up the night for you; our offered binoculars are manufactured utilizing finest quality material and advanced technology following the standards of industry. The binoculars offered by us are checked in terms of quality before delivering at customer’s end. We are giving these binoculars from us on diverse specifications. Knowing how fast a player pitches or runs can instantly influence a coaching decision. And 15 over the limit doesn't seem so excessive when you find out what they're doing down on the track. The Bushnell® Velocity™ will tell you to /- 1.0 miles per hour using digital technology and DSP (digital signal processing). Measure the speed of a baseball from up to 90 feet, or a vehicle from as far as 1,300 feet. Battery Type :- C (2). Operating Temperature Range :- -32 - 104 F / 0 – 40 C.